Two Pages Facing: Some Suggestions for Advertising Display (Philadelphia: The Curtis Publishing Company, 1916) is a remarkable publication. I came across a copy recently while digging into the Arthur S. Allen Collection at the Rare Book and Manuscript Library, Columbia University. (It is available digitally from the Hagley Museum and Library in Delaware.) The book, using layouts provided by Guy Gaylor Clark, Everett R. Currier, J.T. DeVries, W.M. Gerdine, A.K. Higgins, Ben S. Nash, L.C. Pedlar, Benjamin Sherbow, A.B. Sullivan and F.H. Weikel—most names that I have never come across before—and unfortunately printed only in black-and-white, is a tutorial for advertisers on how to design their ads as two-page spreads. This book suggest ways of laying out advertisements which occupy two facing pages, that is, two pages separated by a ‘butte,’ or margins, across which the printing cannot be carried. Such a space, although thus divided, has great potentiality for strong display and unity. It is ample and well-proportioned, and an advertisement upon it holds the undivided attention of the reader. Among the layout suggestions are to use the white space of the gutter as part of the picture, to “lose” the break by hiding it in a larger area of white space, to “suggest converging motion” or “running motion”—both methods of carrying an illustration across the gutter, to use the gutter as a focal point of an illustration, to shift the center of the illustration to one page or the other, or even to disguise the gutter as an element (such as a column) in the illustration. Some of the illustrations are ingenious—using light and shade to turn the gutter into the corner of an ofﬁce building—but others seem corny. Tellingly, photographs appear in only one layout—“Shifting the Optical Center by Means of Rules—and there they are secondary to an illustration. While the emphasis on illustration, and lack of color, make the layouts in Two Pages Facing look old, not all of the layout ideas are old-fashioned. 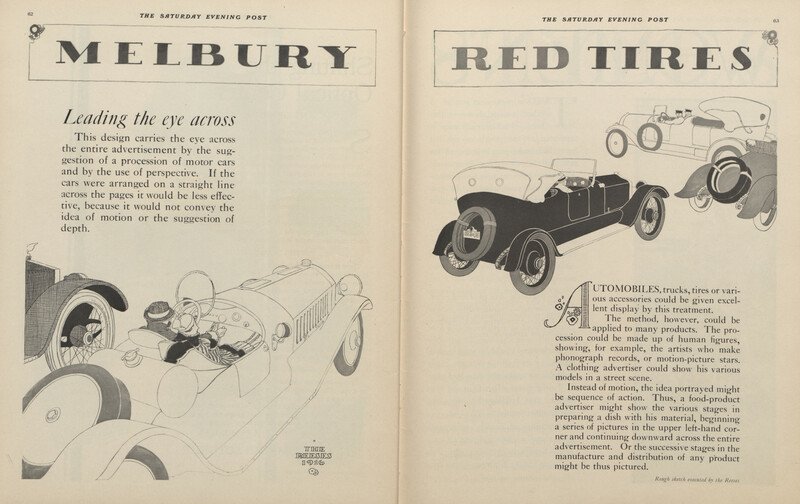 Those that try to turn the two pages into a single, seamless design anticipate the modernist ideas of the 1920s. “Leading the Eye Across” from Two Pages Facing (1916). Design by The Reeses. The Curtis Publishing Company, which published Ladies’ Home Journal, the Saturday Evening Post and other large circulation magazines of the time, was willing to have advertisers copy these layout ideas. “We shall be glad to give permission to an advertiser to use or adapt any of the designs,” they declared. However, “To avoid the use of the same idea by more than one advertiser, it is essential that application be made to us.” How did they police this? Did advertisers use these ideas for advertisements in publications not controlled by Curtis? 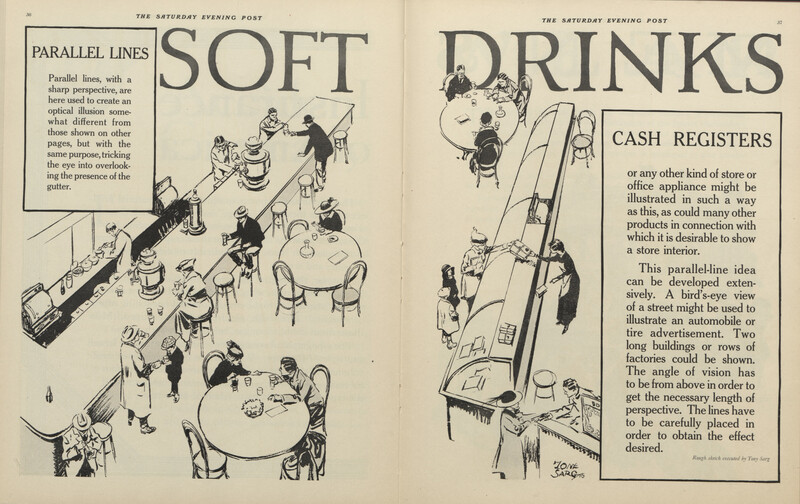 It would be interesting to look at American magazines from 1917 to see if there are advertisements that copy these ideas.